Markus Rehm of just won the IPC World Championships in the Long Jump event. The big difference between his victory and all the other gold medals winners out in Doha, is that his performance would put him in the mix for medals at the able-bodied World Championships as well. This victory thrusts him into the world spotlight in a similar to Oscar Pistorius was back circa 2010, a headache that was just a German problem is now a world problem, should Markus Rehm be allowed to compete against the able-bodied athletes in major championships? Markus has actually been peppering the 8.20m to 8.30m marks for a few years now, and last year had both the qualifying mark for the World Championships, and won the German National Championships, making him a prime candidate for automatic selection for the team. The Germans however didn’t select him, their exact reasoning is unknown to me, but contrary to current trends, the humble German Markus, did not pursue this in the courts. Each year he jumps further this becomes a more serious issue which needs to be resolved, this is no longer a one-off case of Oscar, now we have Markus, and we should expect more in the future. The big stand-out issue in the case of Markus is that he actually jumps off his prosthetic (as most amputee jumpers do). The fundamental argument is that why would you do that if it offered no advantage? And if it offers an advantage should it be allowed in able-bodied competition? I once attended a talk by MIT professor Hugh Herr, a double amputee himself who works in engineering prosthetics and helped with research on the Oscar Pistorius case, who said that he sees the future of para-athletes as the fusion between engineering and humans, if the technology is allowed to continue progressing, disabled athletes in combination with their prosthetics, will be far surpassing the performances of the able-bodied athletes. Maybe this is beside the point, but ultimately my opinion is that these things definitely need to be treated more pro-actively, the rules and regulations need to be set and clarified before these situations arise. Any dispute at this point and the only person who will suffer is Markus himself. Any athlete knows that all you want to do is train and be allowed to compete, and you don’t want to have to be dealing with politics and court cases along the way. Anyway, enough with the lengthy introduction, onto the interesting stuff, the maths. The long jump take-off is very simple, you are running down the runway as fast as you can, you now need to apply enough force in a very short period of time to raise your centre of mass in the air to travel as far as you can into a sandpit. You’re running, and then you jump. The take-off is a compromise between maintaining as much speed as you can from the run-up, which gives you forward speed in the air, and producing a vertical impulse to project you upwards. I call this a compromise because producing a higher vertical impulse will generally have a negative affect on forward velocity, so the compromise is finding the optimal amount for a particular athlete i.e. adding no vertical impulse and just running off the board is zero extra impulse but maintains speed the best, and it doesn’t result in a long jump. 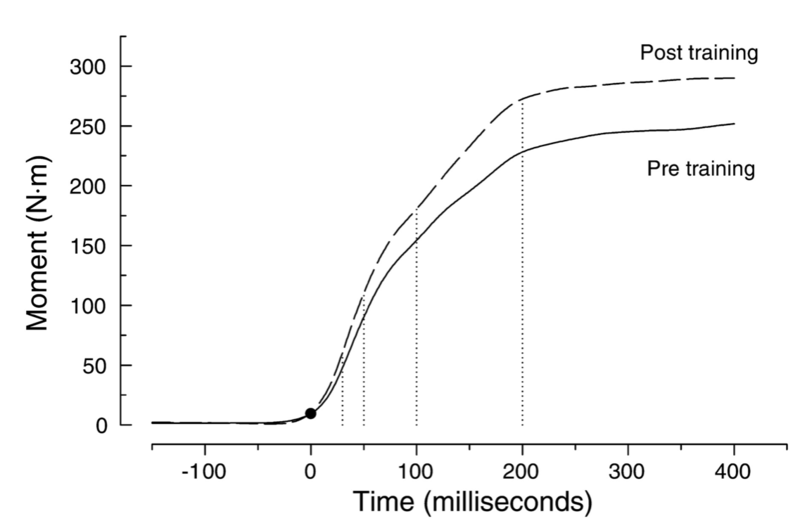 Therefore the impulse is actually equally to the area under this graph, the amount of force multiplied by each small time increment if you split the curve into a lot of very thin rectangles. 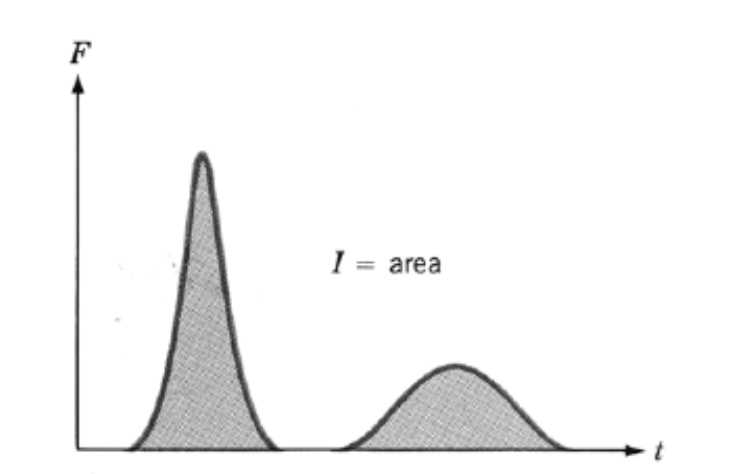 In maths this process to find the area under the curve is integration. So to increase the impulse, we can either increase the amount of force applied, or increase the time over which it is applied. Now we are going to look at how these two factors affect a long jumper, with either a leg or blade. When long jumping on a leg, the time with which to apply force to the ground is inherently limited. Running fast on the runway requires relatively short ground contact times, so to increase these times for the last contact the hips are lowered slightly, this puts bend in the leg and allows a slightly longer period of time on the floor to apply force. However, the greater the hip and knee bend the greater the moment at these joints, a moment which is acting to collapse the leg. A moment is force acting at a distance from a pivot. Therefore, for a given athlete, there is only a certain amount of knee bend which can achieved at take-off before collapse, and so the contact time is limited is limited by this. When a prosthetic blade is introduced for a below the knee amputee, what you introduce is another mechanism for deformation. There is still give at the hip and the knee, but now there is the bending of the carbon blade as well, so without increasing the collapsing moment on the leg this additional bending will actually increase the amount of time the athlete is on the floor for, giving them the chance to apply a greater impulse. The contact times in sprinting and jumping are so short that we can actually produce only very small amounts of muscular force. These contacts times are short and so are on the steep part of the curve near the left, therefore any small increase in the contact times (perhaps facilitated by increased deformation of a carbon blade) will dramatically increase the amount of muscular force allowed to develop. This greater muscular force can then feed back into the earlier equation and increase M(max) and allow a slightly deeper hip and knee bend as well, increasing the contact time for double benefits. In the body this is one of the roles of tendons, to delay the onset of peak force, which gives the muscles more time to contract and reach a higher peak force to handle the load, now you have an athletes tendons, plus the carbon blade working towards this same goal. The other major influence on force production is that because of the extra theoretical degree of deformation of the leg overall on a para-athlete, there is the possibility that this would allow a different technique for take-off. A technique that may put the body in a better position to apply force to the board without increasing the torque at the hip and knee, hitting the board with a straighter alignment and using the carbon to absorb energy and return it on take-off, a theoretical further advantage which would need to be studied further. A greater ability to apply force may result in greater deformation of the blade and thus a higher contact time again. All of these factors will also have an affect on how an athlete can train long-term. Long Jump athletes will be limited by how many jumps they can do in training due to risk of injury. Its very difficult to pin down a specific cause of injury, but a big concern must be the high peak forces transmitted through the leg at take-off, a short impulse time necessitating higher forces to produce an adequate impulse for jumping. Even if the blade only increases contact time and doesn’t allow greater application of force, the lower peak forces overall could allow a greater volume of jumps to be performed in training, a greater training affect leading to an advantage? This argument gets a bit too theoretical so I’m going to try and steer clear now. Just remember this is all theoretical, but so far, with a carbon blade we can increase the contact time, which allows us to increase the force applied, which could then increase the contact time further. It all seems up (a subtle pun on the jumping direction) to me so far, so I will also try and provide some balance. There are multiple downsides. First compare the world record for the amputee 100m to Usain Bolt (not entirely scientific, but acceptable for a blog post) 10.57 for double leg amputee Alan Oliveira of Brazil versus 9.58 for the able-bodies Bolt. It would appear that his ability to reach a higher runway velocity would be limited due to the prosthetic, and higher runway speeds being correlated with longer jumps, this would be a disadvantage. However, although this is a disadvantage, the fact that he still manages to jump as far as Greg may provide further evidence that the blade is providing a competitive advantage. Maybe…. Similarly, and I hope not to come across as to patronising here, but the lack of a lower limb will affect other areas of training and of life. There will certain exercises which will be difficult, or even impossible with a prosthetic that other jumpers may consider very important. Even exercises lifting weights will need to be adapted or changed. Too much impact can cause problems at the interface between prosthetic and limb. The prosthetics used for every day life are far less efficient than when walking with two legs, so its actually metabolically more costly to do any every day task for him. The problem becomes what advantages and disadvantages should you be weighing up to decide if it is fair to compete? Athletics ultimately is the epitome of unfair, otherwise everyone would jump the same distance and cross the finish line together, I don’t know if this is an argument for or against his participation. Throughout this whole discussion, there is no way to actually prove beyond reasonable doubt whether there is an advantage or not. We can prove that it is different, but does different mean better or worse, no one knows. The question becomes should different be allowed? If allowed, can able bodies athletes start adding Carbon blades under their feet for some of these theoretical advantages? If so, you then change the physiological and technical requirements of the event and actually a person who may have used to be mediocre could become the best in the world because their physical traits didn’t quite match up with the old event but do with the new one. There is a lot to think about and it becomes more of a philosophical debate. Lie I said at at the start the only person this negatively affects is Markus really. This contentious issue should have been dealt with more completely the first time around and hopefully it can be cleaned up more thoroughly now. It appears obvious that the force analysis presented shows that the take off force from a blade is superior to a leg/foot. For this reason alone I feel that blade users should not be allowed to compete against non users. What puzzles me is WHY Markus Rehm wants to compete in this way? He will undoubtedly win a Paralympic gold in long jump and he will be competing against like for like competitors with no grey area. I have heard Markus comment that he feels his blade has both advantages and disadvantages. What he doesn’t take into account is that the able bodied jumpers DON’T have access to either of those. This makes him too different from the other competitors. Sorry Markus, but he IS different and if he is allowed to compete with a prosthesis then it would be the thin end of the wedge for allowing other potentially helpful mechanical aids in sport. i.e. if a swimmer has smaller feet than another, should he be allowed to use flippers?